TDC abstract: Psilocybin, a prodrug for psilocin, appears to have detectable effects on brain activity the day after an experience in those with treatment-resistant depression. There’s a rise in functional connectivity within the default mode network (DMN) and a decline in functional connectivity between the parahippocampus and prefrontal cortex. Psilocybin is a prodrug for psilocin, a nonselective 5-HT2A agonist. Studies have shown it and other psychedelics may be useful in the treatment of psychiatric conditions like depression, anxiety, and addiction. The efficacy may correlate with “mystical” or “peak” experiences, meaning those who have those experiences under the influence could receive greater benefit. Findings in healthy volunteers and patients indicate psychedelics elicit powerful acute experiences and can cause lasting psychological changes, such as an increase in openness. Not many drug experiences are known to produce lasting effects and using drugs in this way is a fairly unique treatment method for psychiatric conditions. Research has shown psilocybin acutely disrupts functional connectivity within resting state networks like the default mode network (DMN) while increasing global connectivity. The goal of this study was to investigate how psilocybin affects brain activity in the post-acute period and to see if any changes correlate with treatment response in people with treatment-resistant depression. The post-acute period of a psychedelic is sometimes referred to as an “afterglow” due to the presence of positive mood changes. 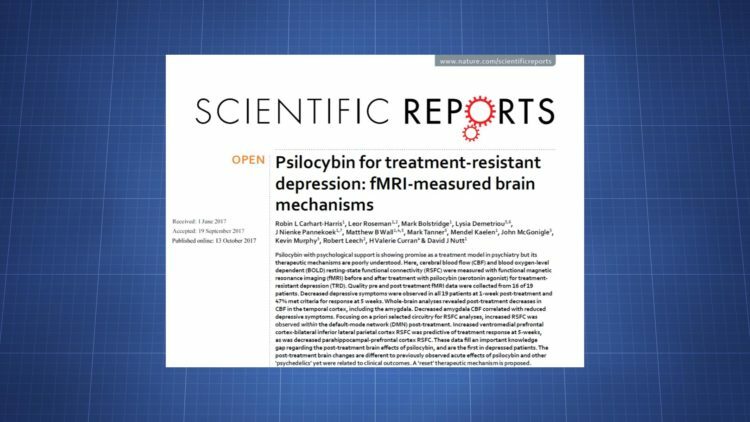 19 patients with treatment-resistant depression received 10 mg psilocybin and then 25 mg a week later. fMRI was used to look at brain changes between pre-treatment and one day after the second treatment session. Blood flow was measured using the arterial spin labeling (ASL) technique and the blood-oxygen-level dependent (BOLD) signal was used to look at resting state functional connectivity (RSFC). 16 ASL results and 15 BOLD results were ultimately available for analysis. Depression was measured using the QIDS-SR16 scale. In the ASL group, the average score was 16.9 in the week before the pre-treatment scan. That fell to 8.8 by the post-treatment day. Overall (for all participants), the average baseline score at screening was 18.9 and by five weeks post-treatment the average was 10.9. These values mean there was a significant decline in depression lasting at least 5 weeks beyond treatment. All 19 showed at least some positive effect after 1 week. 12/19 were considered responders, meaning they had at least a 50% drop in their depressive symptoms. By 5 weeks, 18/19 had some decline in symptoms and 47% were responders. All of the significant changes in blood flow after treatment were declines. Significant declines appeared in the left Heschl’s gyrus, left precentral gyrus, left planum temporale, left superior temporal gyrus, left amygdala, right supramarginal gyrus, and right parietal operculum. The amygdala data was analyzed further for a couple reasons. First, increased activity in that region has been associated with depressive symptoms. Second, a change in blood flow was observed after psilocybin. A significant relationship existed between the post-acute drop in depressive symptoms and reduced amygdala CBF (p=0.01). Though no significant difference was found when comparing responders and non-responders at 5 weeks, so this amygdala CBF decline didn’t predict later treatment response. RSFC analyses were completed with four regions deemed relevant to depression: subgenual anterior cingulate cortex (sgACC), ventromedial prefrontal cortex (vmPFC), bilateral amygdala, and bilateral hippocampus (PH). An increase in RSFC between the sgACC and posterior cingulate cortex (PCC) was observed, but it didn’t correlate with the initial drop in depressive symptoms or response at 5 weeks. An increase in RSFC between the vmPFC and bilateral inferior-lateral parietal cortex (iLPC) was observed. It didn’t correlate with the initial decline in symptoms, but it predicted response at 5 weeks, with responders showing significantly greater vmPFC-iLPC RSFC increases than non-responders (p=0.03). A decrease in RSFC between the PH and a prefrontal cortex cluster featuring the lateral and medial PFC was seen. This didn’t correlate with the initial decline in symptoms, but it predicted response at 5 weeks, with responders showing significantly greater PH-PFC RSFC decreases (p=0.04). Amygdala RSFC wasn’t significantly altered. Analysis of connectivity for 12 resting state networks revealed post-treatment increases in the default mode network, dorsal attention network, and posterior opercular network. However, none of these survived multiple comparison correction and they didn’t correlate with depression outcomes. Decreased RSFC between the default mode network and right frontoparietal network was seen, as was increased RSFC between the sensorimotor network and right frontoparietal network. However, neither survived multiple comparison correction and they didn’t correlate with depression scores. Do specific aspects of the psychedelic experience mediate post-acute brain changes? “Mystical/peak” experience scores from the psilocybin session were analyzed to see if they correlated with parahippocampal RSFC changes. Patients with the greatest peak experience scores had the greatest decreases in PH RSFC with limbic areas (e.g. bilateral amygdala) and DMN-related cortical regions, like the PCC. Changes in brain activity appear to exist in the post-acute period of a psilocybin experience, though the changes are substantially different from what’s seen acutely. While the acute experience is characterized by disintegration of core resting state networks alongside global integration, there seems to be a reintegration in the post-acute phase, with minimal impact on global connectivity. DMN functional integrity declines in the acute phase of psilocybin, LSD, and ayahuasca. Yet post-acutely psilocybin seemed to increase DMN integrity and greater RSFC between the vmPFC and iLPC predicted treatment response at 5 weeks. Given these findings, there may be a “reset” triggered by psilocybin that involves a disintegration of the DMN followed by a reintegration that normalizes activity. Earlier work has found increased DMN integrity could correlate with depression (particularly ruminative thought patterns). Given this, the psilocybin results might surprising. However, not all studies have shown elevated within-DMN RSFC in depression and some results have actually shown lower RSFC between some DMN regions. Of particular interest was the change in RSFC between the parahippocampus and prefrontal cortex. This connectivity declined in the post-acute period and that shift was predictive of response at 5 weeks. A post-hoc exploratory analysis suggested “peak” acute experiences could mediate this change. PH-PFC RSFC is typically elevated in depression. In conclusion, this paper documented resting-state blood flow and functional connectivity changes in the post-acute period of a psilocybin experience for the first time. The study was conducted in those with treatment-resistant depression. 47% of patients were responders at 5 weeks. Reductions in PH-PFC RSFC and increases in vmPFC-iLPC RSFC predicted response at 5 weeks. The study was limited by its small sample size, its absence of a control condition, and by its lack of multiple comparison correction in all analyses, which raises the chance of false correlations.